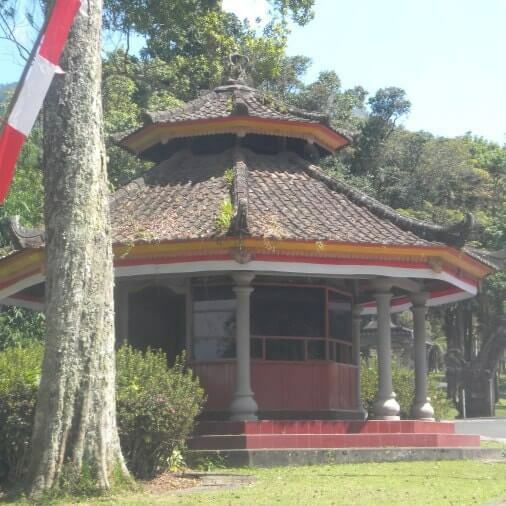 Eka Karya Botanic Garden or Kebun Raya Bedugul has been a pioneer in conserving plant in Indonesia, a beautiful garden complemented by living collection, herbarium and preserved plant. Visitors can try Bali Treetop activities that are carried out here in the open environments. You can also enjoy the beautiful landscape, amazing scenery of the mountain forests, direct views overlooking the Lake Bratan and Ulun Danu Bratan Temple, clean air, cool mountain atmosphere and spacious tranquil surroundings. A magnificent garden with harmonious blend of scientific and conservation purposes. The garden is also a member of Botanic Garden Conservation International (BGCI). Let's take a closer look to this botanic garden! Bedugul Botanical Garden & Bali Treetop activities are carried out in the open environments at the garden every day at 8:30 am to 6:00 pm. This activities offer many challenges such as suspended bridges, spider nets, tarzan jumps, flying fox, flying and other swing. There are 7 (seven) circuit from a tree to another trees at a distance of 2-20 meters. All circuit platforms are held in place using an innovative compression system to protect the trees from damage. From the Yellow Squirrel Circuit to the Adrenaline Black Circuit are open to the visitors from the class above the age of 4 years to 70 years with maximum weight of 120 kg. 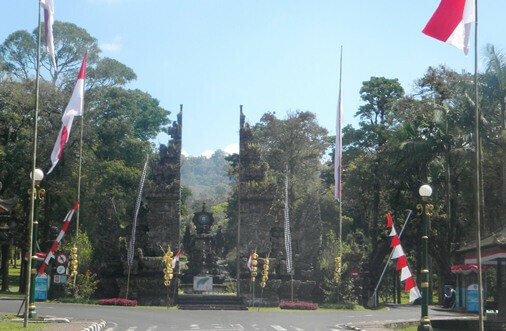 Kebun Raya Bedugul has become a member of Botanic Garden Conservation International or BCGI. The BGCI mission is "to mobilise botanic gardens and engage partners in securing plant diversity for the well-being of people and the planet". Botanic Garden Conservation International aims to collect, conserve, characterize and cultivate samples from all of the world’s plants. BGCI provides a global voice for all botanic gardens and dedicated to plant conservation and environmental education to save the world's threatened plants. This largest plant conservation network includes: globally significant ex situ collections, covering approximately a third of known plant diversity; world class seed banks, glass houses and tissue culture infrastructures, and; technical knowledge networks covering all aspects of plant conservation policy, practice and education. The Bedugul Botanic Garden is a nationally renowned center of excellence in the research of plant biodiversity and biodiversity conservation. The garden has been a pioneer in conserving plant in Indonesia, a beautiful garden complemented by living collection of trees, orchids, herbaria, ferns, cacti, collection of seeds, seedlings and other plants that have scientific, economic, cultural and aesthetics values. Bedugul has an extensive collection of huge trees and flowers including various types of orchids. They are very beautiful during the flowering season. 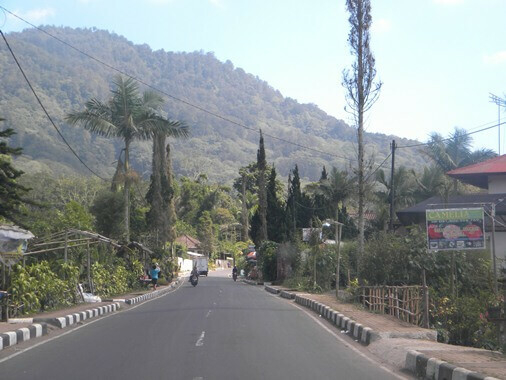 Bedugul has a forest atmosphere and strong natural shades. It is accompanied by a mild climate and awesome panoramic views overlooking the Lake Bratan. This is the main reason for many couples to do pre wedding photoshoot in Bedugul. The Garden has several unique features and one of them is an awning gazebo. The building is designed with a simple construction, not too excessive and often used as a shelter and relaxes. The building has an overlaps roof with octagon shape. There are eight poles or pillars holding in each corner. 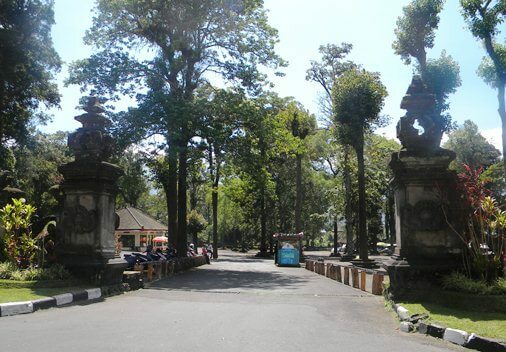 Kebun Raya Bedugul is a natural open space, has a cool temperature and a pleasant family recreation on weekends. In addition there are some major activities such as research and library and outbound. The garden has four main functions consisting of exploration, inventory and research; conservation; recreation; and education. The services offered by the garden include scientific services and facilities in support of plant research and conservations, seed banks, herbarium, glasshouse, nursery, library, database of plants and also equipped with gardens and water features in the landscape theme. Eka Karya Botanic Garden also becomes an extensive outbound location. The tall trees and shade of canopy give the impression of cool and pleasant on the outbound activity. This activity is a favorite choice for companies and institutions that want to try Outbound and Team Building in Bali. 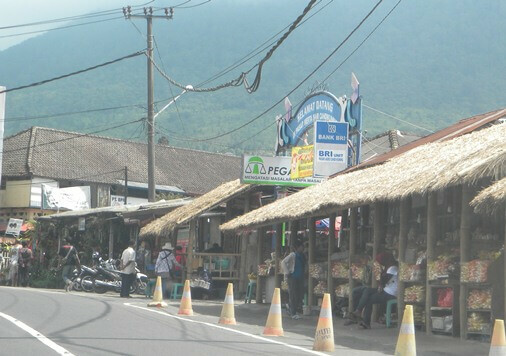 Kebun Raya Bedugul is located on the slopes of Mount Tapak. This vulcano has an altitude of 1.909 meter asl or 6.263 ft. When reaching the top, trekker can enjoy the stunning surroundings. Trekker should have been up at the top as early as possible because the scenery is still clear and beautiful. During the day this area will be covered by thick fog. These mountain trekking can be done through two pathways. The first path is through Pancasari village of Lake Buyan. The second path is through Eka Karya Garden. After paying admission to the garden visitors can continue the trekking. The trekking route through the garden is more organized. 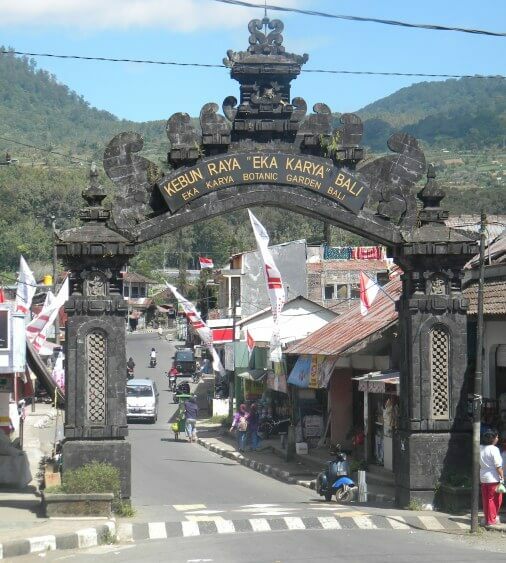 There is also a holy temple on this route called Pura Pesimpangan Puncak Terate Bang. The soil around the Eka Karya Botanic Garden is very fertile because of the volcanic soils which derived from volcanic mountain group of Lesong-Pohen-Sengayang. The combination of water source, cool climate, and fertile volcanic soil make this area most suitable for agriculture, vegetables and fruits plantation. However, agricultural development is limited related to the presence of The Forest Protected Areas Mount Batukau (Kawasan Hutan Lindung Gunung Batukau) in Baturiti area. The name "Eka Karya" in Balinese language, "Eka" means first and "Karya" means creation. This is in accordance with the status of the park as the first botanical garden in Indonesia which has been established after the proclamation of independence. At first, the garden is intended to specialize in cultivation of coniferous plants (non-flowering seed plants or Gymnosperms). The garden is operated by The Indonesian Institute of Sciences (LIPI). The garden is situated at an altitude up to 1.450 meters with an area of 157,5 hectares (389 acres). It was established on 15 July 1959 on the slopes of Tapak Hill, Candikuning Village and has more than 18.000 taxa of plants belonging to 2.100 species. The plants come from the mountainous areas in eastern Indonesia consisting of Bali, Nusa Tenggara, Sulawesi, Maluku and Papua. In addition, its herbarium also contain 10,000 preserved plant specimens ranging from algae to flowering plants. Eka Karya Botanic Garden is situated in Candikuning Village, District of Baturiti, Tabanan Regency, Bali, Indonesia. The garden is surrounded by Bedugul Caldera along with these interesting attractions: Lake Bratan, Lake Buyan and Lake Tamblingan. Visitor can access this place directly from Ngurah Rai International Airport, for about 62 Kilometers (2 hours). 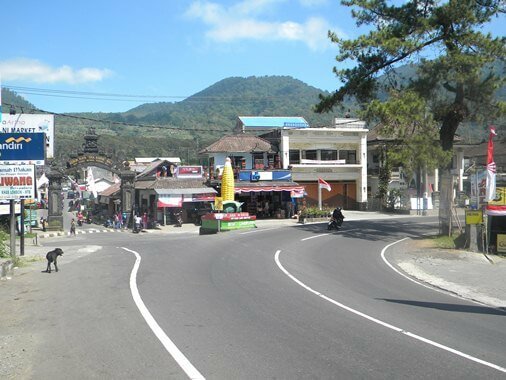 Also accessible from Tabanan City to the north for about 35 kilometers (1 hour). Kebun Raya Bedugul is influenced by Very Wet Region Climate (A type climate based on Schmidt-Ferguson climate classification maps) and the cool climate due to its location at an altitude of 1.250-1.450 meters asl. The weather on this area is unpredictable and even though there's no rain, fog always blanketed this area. The garden is operated by PT Balai Konservasi Tumbuhan Kebun Raya "Eka Karya" Bali, LIPI. The office is situated in Eka Karya Botanic Garden, Candikuning, Baturiti, Tabanan, Bali Indonesia. The garden open hours at 7.00 am to 6.00 pm daily. 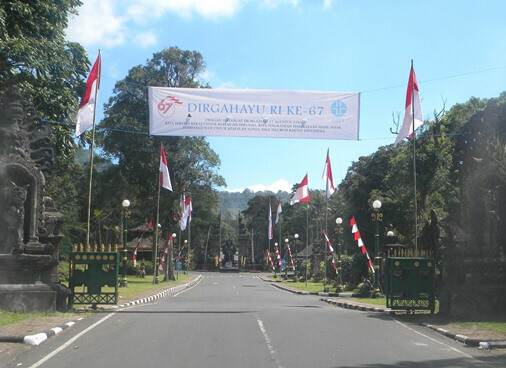 The existence of Kebun Raya Bedugul was preceded by an idea to establish a branch of the Botanical Gardens outside of Java. This idea was initiated by Prof. Ir. Kusnoto Setyodiwiryo which that time served as Director of the Institute for Nature Research Center and also served as a head of the Botanical Gardens Indonesia and I Made Taman, who served as chief of the Conservation And Preservation Of The Environment. 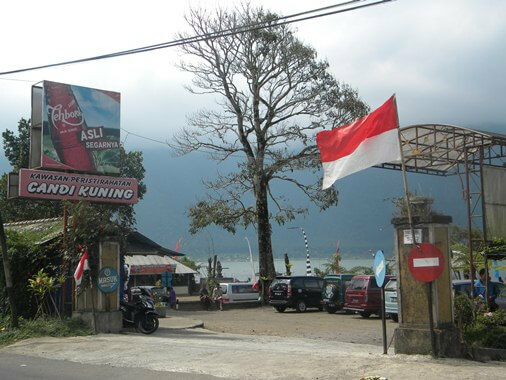 The idea had been realized in Bali on July 15, 1959 at the slopes of Mount Tapak, Candikuning Village at an altitude of 1.250 - 1.450 meters (4.101 - 4.757ft). Entering the garden visitors can enjoy the beautiful landscape, amazing scenery of the mountain forests, direct views overlooking the Lake Bratan and Ulun Danu Bratan Temple, clean air, cool mountain atmosphere and spacious tranquil surroundings. Visitors can also see several interesting spot such as Trees Collection, Orchid Park, Traditional Balinese House, Ceremonial Plants Collection, Fern Park, Cactus, Medical Plants Collection, Rose Park and Hindu Temples. A magnificent garden with harmonious blend of scientific and conservation purposes. The garden offers a place where visitors can feel comfortable in a beauty and peaceful surroundings while doing research activities or learning about the use of plants in Balinese culture and also many tropical rainforest plants and interesting birdlife.